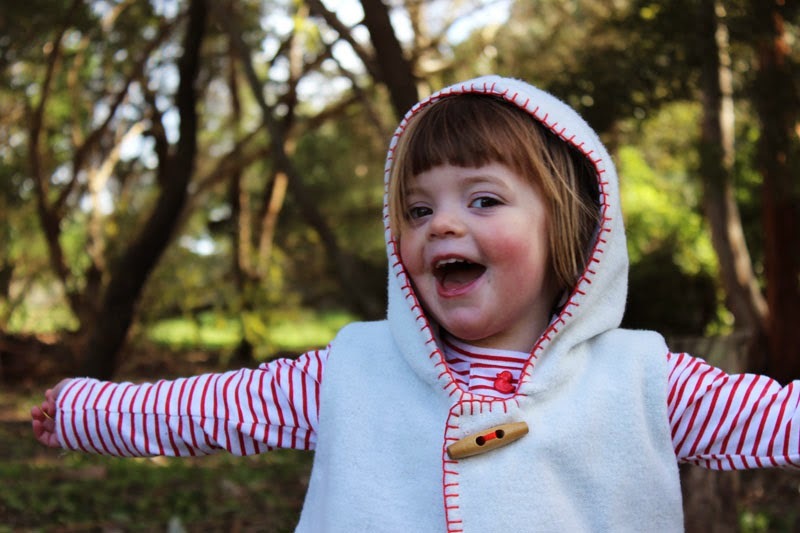 The pattern was made by Lydia from Little Kiwi's closet. 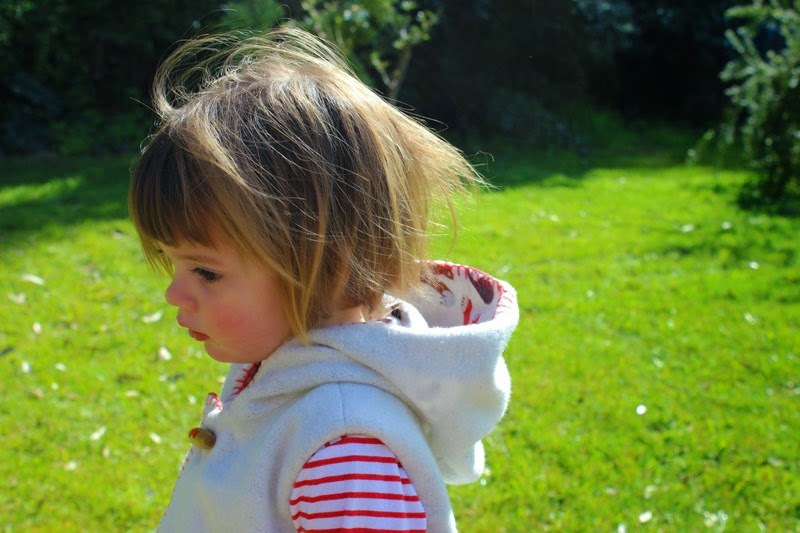 Lydia is a NZ lady who has an etsy pattern shop and blog. 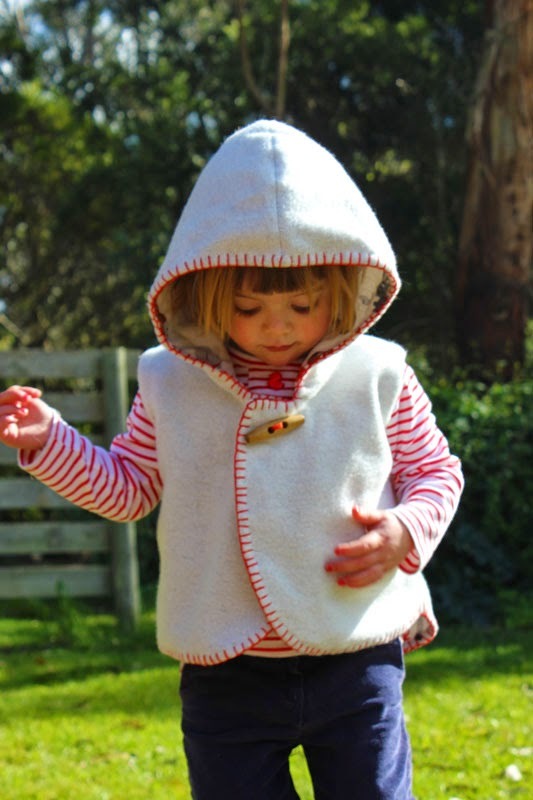 You can read about the vest and download the free pattern here. 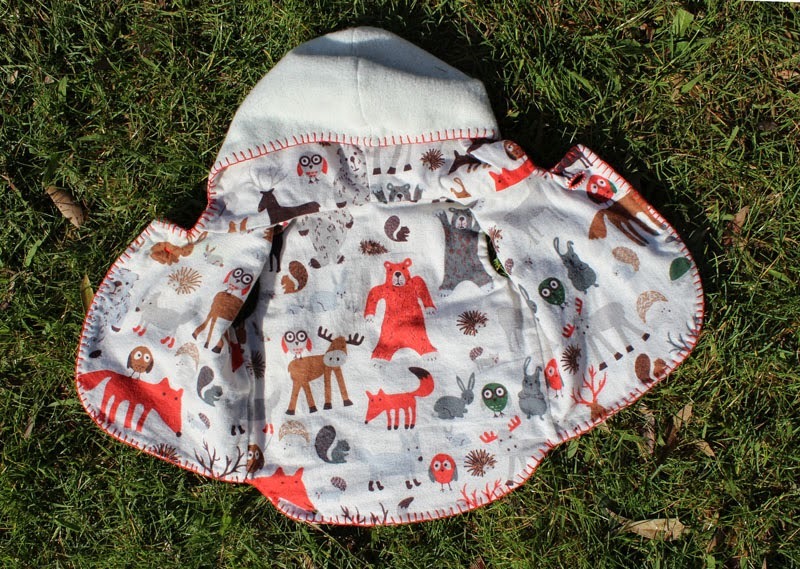 The pattern is available is available in sizes 12 months - 6 years. I made size 2 for Emily who is on the smaller size of 2 (although she is 2 years, 5 months) . For me (or should I say, Emily), the fit is spot on and it is a very simple little project. I will admit though that I did not read the instructions (naughty me), and since this is no formal pattern review I can just tell you the finished product is very cute! I made mine from grey marle windcheater (sweater fleece) with the wrong side facing out. I lined it with some flannelette I bought a couple of months back from Spotlight. I made the stripey top Emily is wearing underneath too but she was all finished with photos before I could photograph it. She does like it though since it has three red ducky buttons on it! 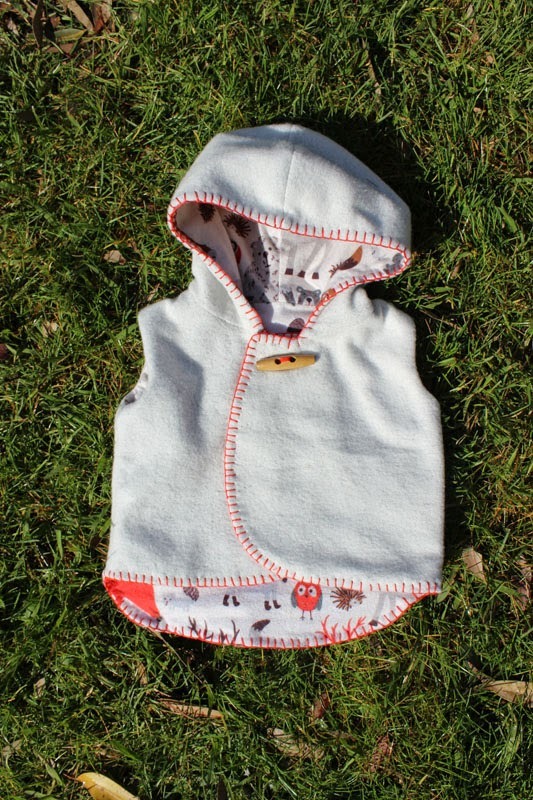 The vest is reversible, depending on whether you decide to sew on a button on each side. 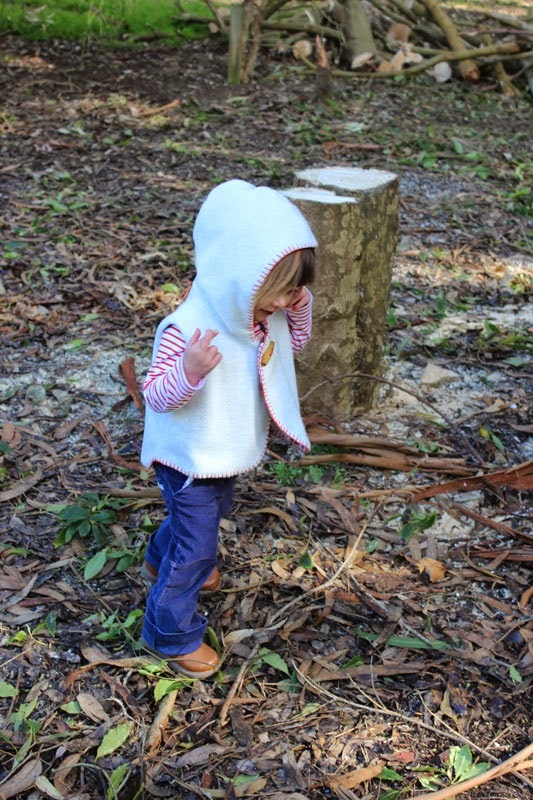 I added blanket stitching around the edge and used a big wooden toggle to close the vest. It looks so cosy on Emily and I think it might fit her next year too. Emily is also wearing hand me down cord pants I made using this Ottobre pattern for Issie a few years ago! Gotta love having three girls for value for money! She is standing in front of a tree that my husband felled yesterday (new firewood in the background!). Our property is an ever changing landscape. What an adorable vest and child! It looks so snuggly. I am thinking about fall sewing already and the vest might be perfect. I love it! I want to make one! That blanket stitching finishes it so well! Looks brilliant! Oh Emily is so cute in her new fab vest! I have just downloaded the pattern too! Thanks ladies! It's a fun sew!! thank you for the lovely review Suz. too adorable!! I think Eddie needs one. I just love the blanket stitching! 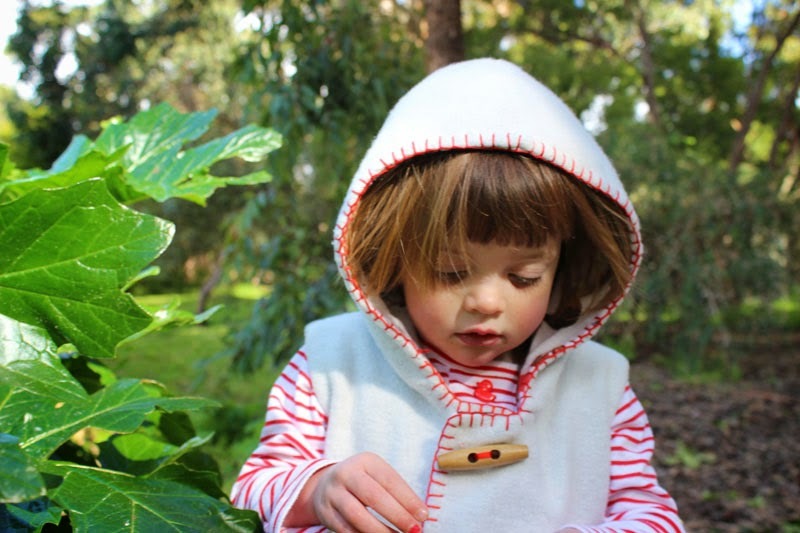 Super cute, I love that wooden button! Love this! And i was umming and ahhing about what to do with some flanelette last night that won't quite fit into a cot sheet but could make perfect lining for this vest! Yay, free pattern ehre we come!